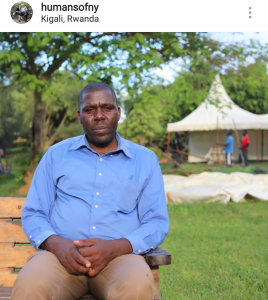 “When I was twelve years old, they undressed a Tutsi girl in front of my entire school. They wanted to see if her private parts were the same as other people. She kept trying to cover herself with her hands while they pulled out her hairs one by one. I can still hear the laughter. Even with all the violence that came later, that was the most traumatic moment of my life. It’s still the image I see when I’m trying to fall asleep. The genocide didn’t begin until many years later, when I was twenty-five years old. I was a soldier in the army. I could tell the atmosphere was growing more and more tense. Our commanders were openly using ethnic slurs. There was talk of ‘wiping our enemies from this country.’ One night I was assigned to guard four Tutsi prisoners. They’d been accused of making explosives but were clearly innocent civilians. They’d been tortured. Their wounds were rotten and stinking. A major came to the cell at 1AM and ordered me to step aside. ‘These people need to be killed immediately,’ he said. But I refused. I told him those were not my instructions. He pushed and screamed, but eventually he stormed off. The prisoners were released a few days later, but someone followed them out and killed them. It was a sign of things to come. There had always been permission to kill any Tutsis we discovered while on patrol. But on April 6th our instructions became very clear: every Tutsi was to be found and killed. It was even said over the radio. Our first official order was to drive to a nearby city and open fire on unarmed civilians. Most soldiers carried out the orders with glee. The hatred had sunk into their core. Let it be remembered that the killings were pursued with pride, passion, and determination. Soldiers fired indiscriminately at people walking down the road. I pretended to participate, but I didn’t pull the trigger. That night we returned to the camp and everyone swapped stories. They bragged about how many people they’d killed. It became a competition. Soldiers would radio from other bases, and say: ‘We’ve killed so many already. Why can’t you keep up?’ All of it was sickening. I couldn’t eat for weeks. But it was most traumatizing for the Tutsi soldiers in our army. My roommate was a Tutsi. He had to pretend like he was enjoying the murder of his friends and family. He had to laugh along with the others to save his own life. He could only remove his mask with me. And he was the only one that I trusted with my plan. Our base was only twenty kilometers from the border with Burundi. After the first day of killings, I rode to the border on a bicycle– just to study the route. I knew that I was taking a giant risk. But I was a religious person. I was a Christian before I was a soldier. So for me, killing innocent people was more of a risk than trying to help them escape. Many Tutsi families were part of my church community. I had prayed with them many times. So when one of them reached out for help, I could not refuse. They told me their neighbors had just been murdered. They feared they were next. So I told them to gather in one place and meet me at midnight. I snuck out of the camp. I told my roommate to tell everyone I was sick on the toilet. When I got to the meeting place, I was expecting to find one family, but there were twenty-three people waiting. Many of them were too scared to come out of the bush. They saw my uniform and thought I was leading them to their death. But the mother of the family gathered everyone together for prayer. She said: ‘Lord, we are frightened. But we are going to trust our brother in Christ to take us to safety. How I wish this story could reignite the human feeling in most of our friends, brothers and countrymen, both Soldiers and Ambazonia fighters, who are currently fighting in the two troubled regions of Cameroon, to know the red line, in order not to cross. Many are those who will brag on how many they have killed, and when you check, you discover their victims armless and vulnerable people, young boys, women and children whose crime, is only that they are who they are. At the end of the senseless war, who wins?